About "1 Chronicles (Re-Formatted) (Tyndale Old Testament Commentary Re-issued/revised Series)"
The Chronicler wrote as a pastoral theologian. The congregation he addressed was an Israel separated from its former days of blessing by a season of judgment. The books of 1 and 2 Chronicles bring a divine word of healing and reaffirm the hope of restoration to a nation that needed to regain its footing in God's promises and to reshape its life before God. The Chronicler expounds the Bible as he knows it, skillfully weaving his commentary into the linear text of Israel's history. His theme is straightforward--the promises of God revealed in the Davidic covenant are as trustworthy and as effective as the God who first uttered them. 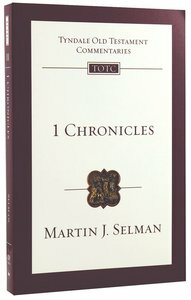 In two volumes Martin Selman provides an excellent interpretation of these sorely neglected yet profound books of the Old Testament. The first volume on 1 Chronicles provides a full introduction that surveys the Chronicler's method, summarizes major theological themes and serves as a valuable entr?e into the heart of the work we now know as 1 & 2 Chronicles. The original, unrevised text of this volume has been completely retypeset and printed in a larger, more attractive format with the new cover design for the series. Martin J. Selman (B.A., M.A., Ph.D.) was lecturer in Old Testament, director of postgraduate studies and deputy principal at Spurgeon's College, London. Dr Selman undertook distinguished research under the guidance of Professor D. J. Wiseman on the social and legal background of the patriarchal period as known to us from Mesopotamian sources. He then gave himself untiringly to his teaching ministry at Spurgeons College, London. He will be best remembered in the wider church for his valuable two-volume commentary on Chronicles in the Tyndale Old Testament Commentary series.-Editorial Review.